This is a "high quality - low cost" cartridge set for the Ionics G11 & G12 reverse osmosis system. 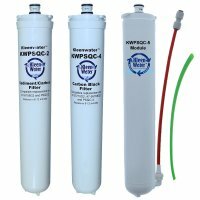 This water filter cartridge set includes (1) KWPSQC-2 sediment / carbon pre-filter which is a compatible replacement to Water Factory / Ionics filter cartridge 47-55706G2. Also included is (1) KWPSQC-4 carbon block filter which is a compatible replacement to Water Factory / Ionics filter cartridge 47-55710G2. The KWPSQC-5 Module / Membrane is the final component which is compatible to Water Factory / Ionics 66-4706G2. This 2 cartridge pre-filtration set should be changed annually to adequately protect the reverse osmosis module and keep the system in peak performance. The module (membrane) should be changed when the total dissolved solids number becomes elevated or permeate water production is diminished. One of these circumstances is typically realized between 3-5 years.